The mouth of the Amazon is the world's largest river delta about 300 miles across. This maze of islands and streams forms a gigantic estuary up which the tidal bore travels over 100 miles. The island of Marajo in the delta covers an area the size of Belgium. So powerful is the flow of the river that its waters color the ocean for hundreds of miles offshore. 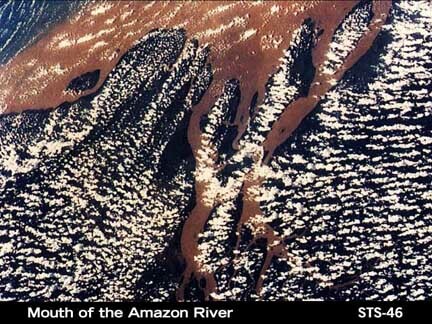 This image was taken from the Space Shuttle (Mission 46), and shows the river flowing into the ocean from bottom to top of the picture.